Some exciting news! 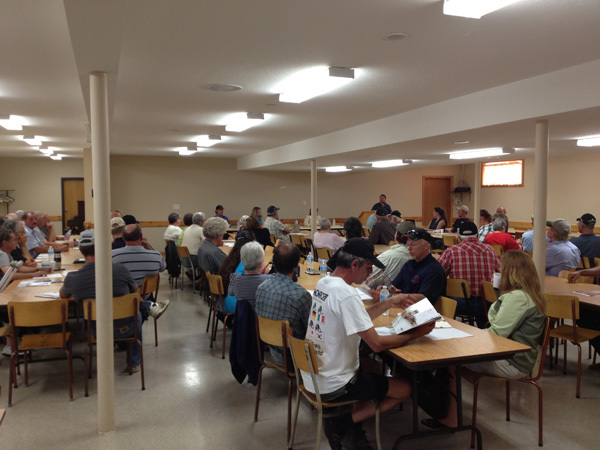 On Monday, August 19, 2013, a new landowner group was formed called the Saugeen Regional Landowners Association. This will be the second landowner group in Grey Bruce county but it is a large area and can support more than one group. A crowd of about 70 people met for the first time at the community centre in Elmwood, Ontario. The meeting got off to a great start with Karen Weimer thanking all those who came out as well as the guests who came from other counties. Several landowner members came to their meeting to lend support, bring signs, literature and magazines to help get them started. President Tom Black came from Ottawa with his wife Marlene and Carleton Landowners Bob and Janie Ralph. Tom gave a brief history of the landowners, talked about some of our wins and encouraged people to put up their Back Off Government signs because some authorities have said that they will not come onto properties, uninvited, where those signs are posted. From Lambton County, President Bill O’Brien attended to offer encouragement and support along with reporter John Phair. Huron Perth Landowner President Cindy Moyer was one of the speakers and presented information on the growing interest in her legal services co-operative which will hopefully bring affordable justice to those in need. OLA researcher Liz Marshall drove down from Dufferin County to talk about the many rights we have and how to protect them as well as a short history lesson as to where our rights came from. Her message that many levels of government have overstepped their mandates by passing by-laws that take away our rights, resonated with the crowd. In this county, landowners are being fined for having their trailers parked on their property, some with fines up to $250 per day. These issues and others have motivated people to get involved. Many groups form because of a single issue such as the Eastern Ontario Outdoorsmen, fishermen and bait dealers who were dealt a huge blow when the MNR arbitrarily reduced the size of “bait” fish allowed and caused the loss of thousands of dollars to these men whose livelihood depended on these sales. The Saugeen Regional Landowners Association have many individual stories but one that is hitting them hard, especially in this rural and cottage countryside, is the bylaw passed that makes it an offense to have your trailer parked on your private property if there is no house on the lot. Many people have bought land in Grey Bruce either for recreation or a retirement dream. These people have been coming to spend quality time on their land for the weekend or a summer holiday and are now facing fines for parking their tent or trailer on their land. The landowners stand on their research that private property is not owned by the municipality and as such, the municipality does not have the right to pass bylaws that restrict what landowners can do on their land, as long as our neighbours rights are respected as well. President Bob Weimer and his wife Karen have agreed to start up the group and have help from several directors. They can be contacted at 519-363-5455. When the meeting ended, several hours later, people gathered together to discuss their issues, to exchange contact information and hopefully to bring continued strength to the landowner movement. The OLA wishes them all the best.